WTF? I must have done something stupid. I double checked everything. I removed the textures. 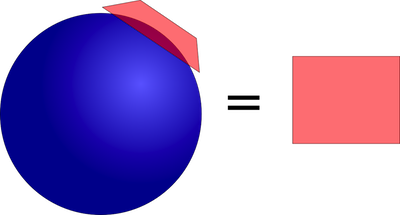 I switched from quads to basic tris, with vertex colours … but still, this perfect circle cut out of the center! My vertex and fragment shaders by this point were exactly one line of code! …I spent ages looking at this, trying to understand what could possibly create “holes” in my geometry. They were obviously holes – you can see through them! Eventually, tired, and with lots of more important work to do, I gave up, shelved it, went off to do other things. Then today I suddenly realised the problem. I’m sure it’s obvious to most of you, but it’s taken me ages to figure it out. And this is what makes it worth posting: the hole is not a hole. Great. But GL doesn’t “bend” the edges – it draws straight lines between corners. 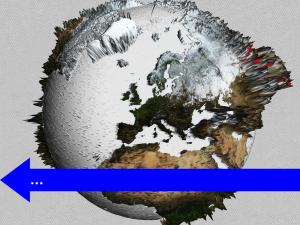 So … when I made my tris larger … the corners were still slightly above the surface of the globe. …but the centers … slightly interesected the globe. And so, of course, the depth-test cut them out. 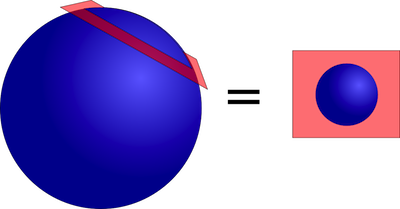 In the diagram below, it looks as if the quad moved closer to the center of the globe – but it hasn’t. The corners are all still the same height above the surface – only the middle has (implicitly) gone “inwards”.